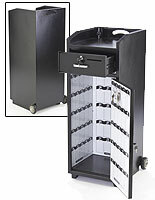 Valet station has (4) 3" wheels for transport, with (2) locking wheels for stabilization. Locking drawer of valet podium has slot to put tickets and tips in securely. 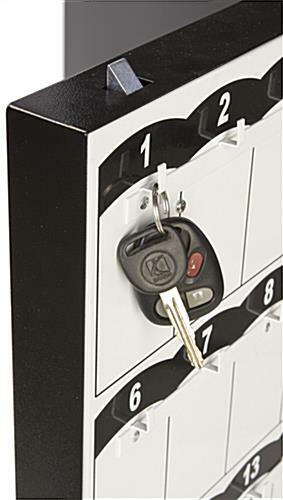 Interior of valet stand has labeled hooks for up to (150) key sets. 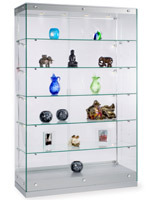 Small shelf has space for locking cash box as well as personal belongings inside valet stands. 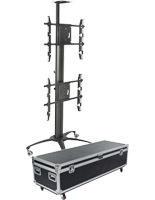 This deluxe valet stand is a heavy duty display made from galvanized steel. 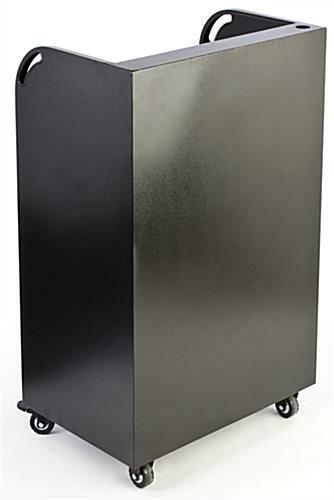 The top counter of the portable station is made from brushed stainless steel, and is perfect for placing clipboards and important information. 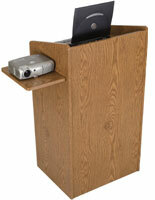 This valet stand, also known as a mobile podium, has a locking cash drawer for placing tickets and tips in. 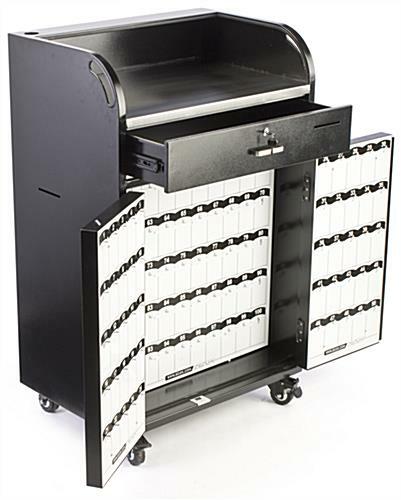 This drawer features a 1/4" slot for placing the tips and tickets without having to open the drawer. 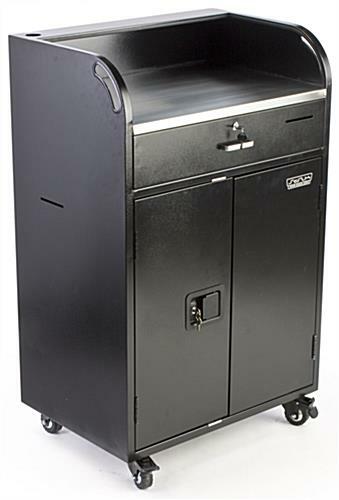 The valet stand has an anti-scratch, black powder coated finish to blend in with any environment easily. This neutral tone also enables the unit to blend with any other fixtures within your restaurant or hotel. 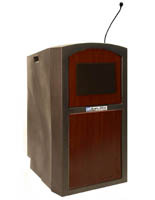 Each valet stand has (4) 3" wheels on the bottom of the unit for mobility. 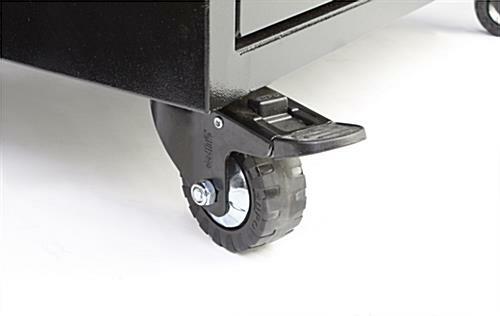 The (2) front wheels are lockable in order to stabilize the unit once in a desired position. This valet stand has a door that features a paddle handle. 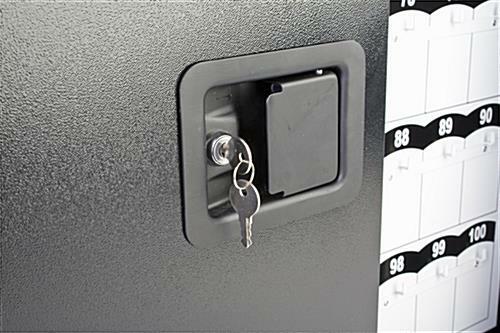 The interior of the key box unit has marked hooks for up to (150) sets of keys. 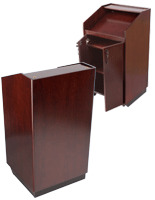 This valet stand also has a small shelf inside that is perfect for placing personal possessions during business hours. There is also space on this shelf for placing an additional cash or key box, with another 1/4" slot in the side of the unit for placing tickets and tips inside. This valet stand has an umbrella holder built into the unit that can hold up to a 1-5/8" diameter pole. 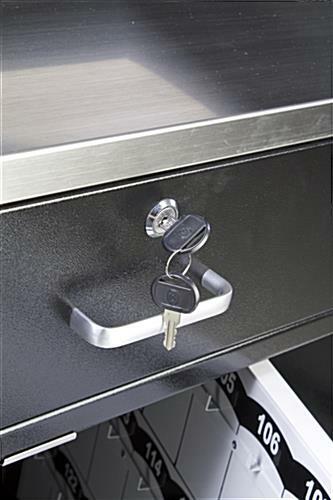 Buy this locking parking equipment today to greet your guests from a stylish booth! This valet stand ships completely assembled! 29.1" x 47.0" x 19.8"